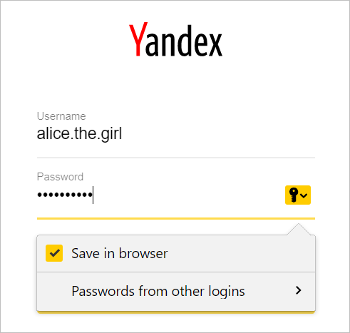 Password manager for Yandex Browser allows you to easily view, change, and delete your passwords. If you have already created a master password, enter it to access your vault. Click Add in the upper-right corner. In the window, enter the website address, login and password. To check that you entered your password correctly, click . Tip. Similarly, you can save your SNILS, passport number, and other confidential information in the password manager. After syncing, the data becomes available on all your devices. You don't have to worry about the security of your data because it is stored in encrypted format. For more information, see the article “How to encrypt any important information in the browser” (in Russian). A list of websites you have saved passwords for appears on the screen. Select one of them. If there are too many sites in the list, start entering the site address in the Search passwords field in the upper-left corner. This filters the list to the right. Click the name of the appropriate site. 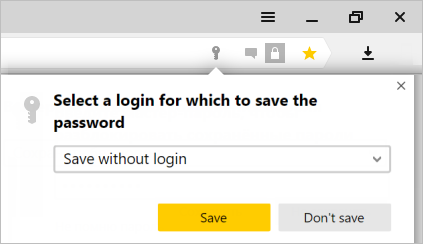 In the window that opens, click in the Password field. 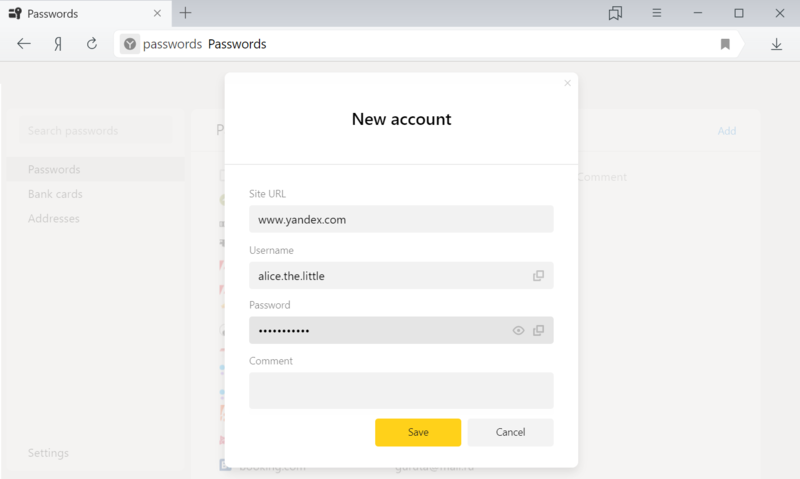 In the Password field, enter your new password.. To check that you entered it correctly, click . Click on the favicon to the left of the appropriate site. In the lower part of the window, click the Delete link. Tip. If you deleted a password by mistake, you can restore it immediately after you delete it. In the lower-left corner of the password manager, click the Restore link. If you reload the page or go to a different tab, the link will become unavailable. 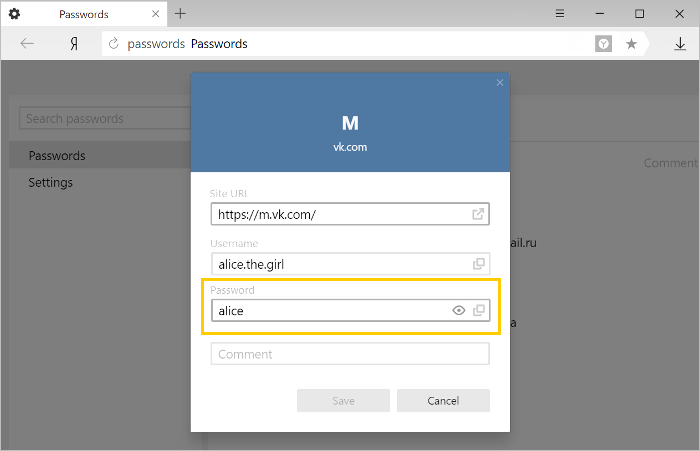 If you have already created a master password, enter it to access your vault. 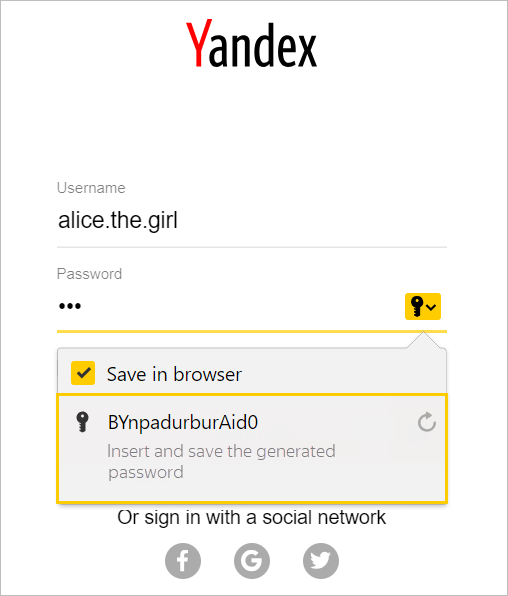 If you forgot your master password, click anywhere on the screen outside of the window. Now the browser stops saving passwords, inserting them into authorization forms and requesting your master password to access your vault. 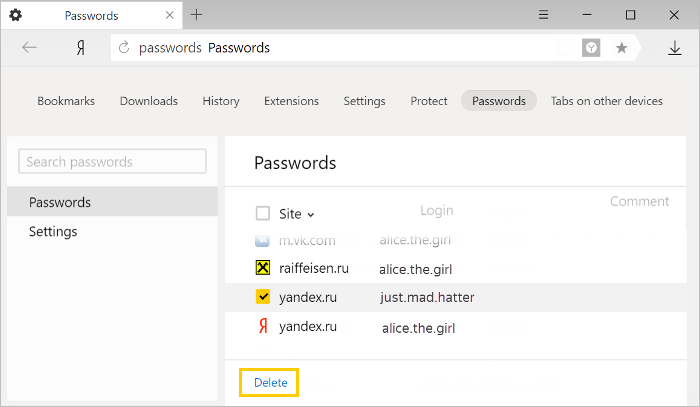 Passwords are kept encrypted on your computer and become available if you turn on the password manager again. To do this, click Enable password manager in the manager settings.